GP con barrage, 41 participantes, 76 sin falta, 5 sin ninguna penalidad en el desempate, diseño del brasileño Guilheme Jorge. 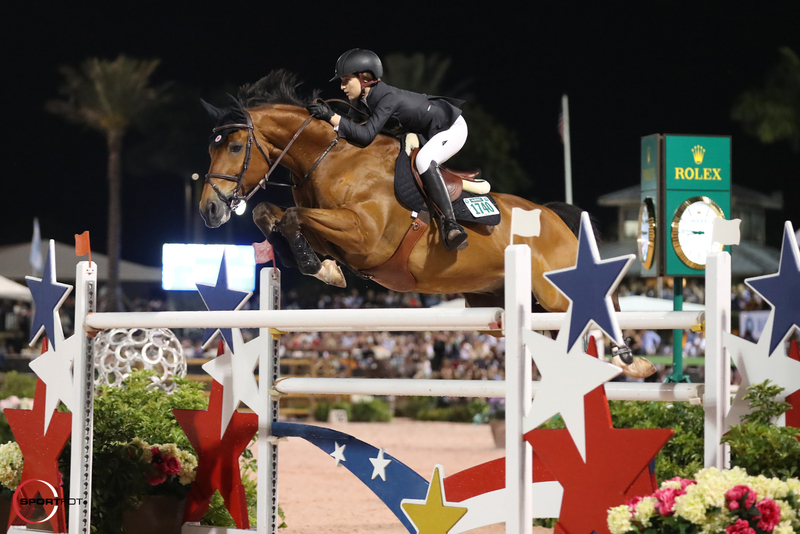 Wellington, FL – The highlight event of the 2019 Winter Equestrian Festival (WEF), the $500,000 Rolex Grand Prix CSI 5*, was held as the final “Saturday Night Lights” class on Saturday, March 30. Topping the ultimate test at WEF were McLain Ward (USA) and HH Azur in a thrilling eight-horse jump-off. WEF concludes on Sunday, March 31, ending a 12-week circuit of top jumper, hunter, and equitation competition that awarded more than $9 million in prize money. The 2019 WEF concludes on Sunday, March 31, at 1 p.m. with the $50,000 USHJA International Hunter Derby on the grass derby field at Equestrian Village. The $50,000 Puissance America Grand Prix CSI 2* and the $50,000 CaptiveOne Advisors 1.50m National Grand Prix will wrap up international jumper competition on Sunday in the WEF International Arena. In a field of 40 entries, some of the best horses and riders in the world vied for the chance to take home the top prize money of the circuit. They were riding over a course set by 2016 Rio Olympic Games designer Guilherme Jorge of Brazil. There were eight that found the key to a clear round to advance to the jump-off. The pathfinder was David Blake of Ireland riding Pine Hollow Farm’s Keoki. They set the pace at 44.36 seconds with a steady clear round, which would keep them in fifth place at the conclusion of the class. The winning time was lowered with the next horse, H5 Quintol, owned by H5 Stables and ridden by Eduardo Menezes (BRA). They sped through and despite a hard rub at the second to last vertical, stayed clear in 39.69 seconds. They would finish in fourth place. Next in was 19-year-old Lucy Deslauriers (USA) riding Lisa Deslauriers’ Hester. With an impressive early rollback to the Adequan vertical and a quick pace through the remainder of the jump-off, they shaved four-tenths of a second off the leading time to finish in 39.25 seconds for third place. In her first class of the week on Wednesday, Deslauriers had a fall in the 1.45m class. 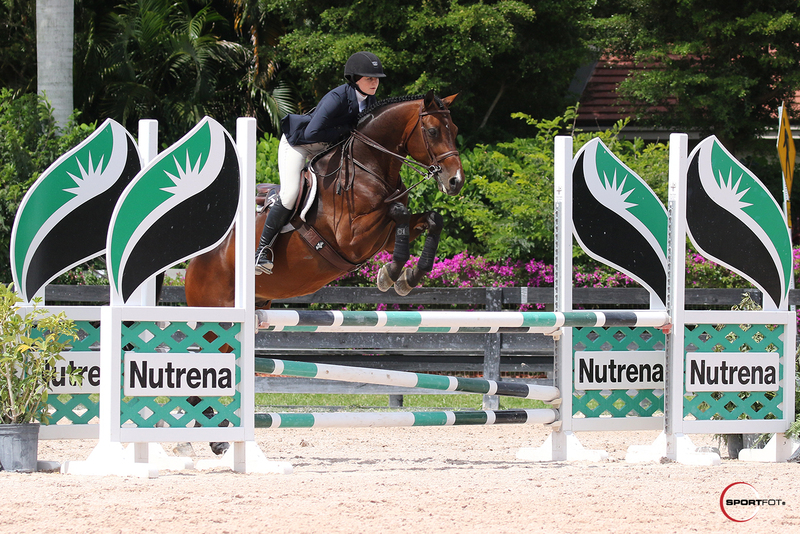 With her usual determination, she bounced back for a solid finish on Thursday to qualify for the Rolex Grand Prix. To the delight of the crowd, the rounds kept getting faster and faster. Rolex testimonee Kent Farrington (USA) and Gazelle, owned by Farrington and Robin Parsky, started off with a blazing gallop and never let up, streaming through the timers in 37.82 seconds. They would have to wait for the remaining four entries to see if their time would hold up. 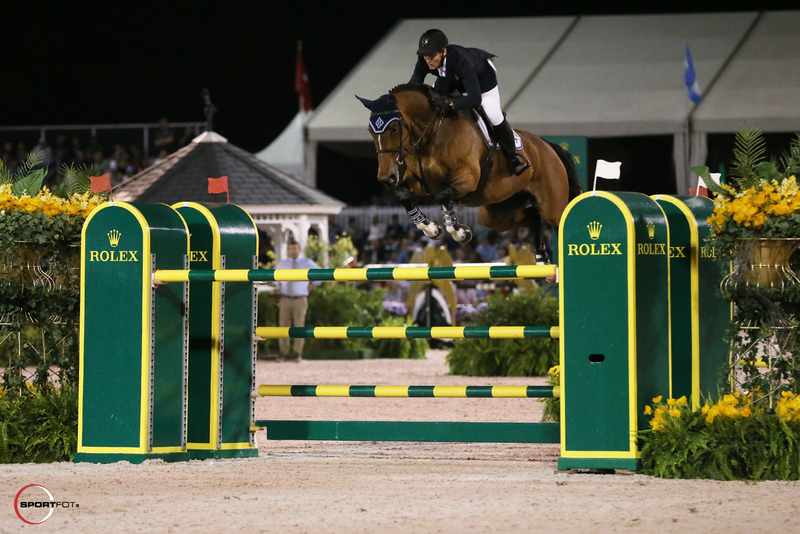 Farrington was proud to represent Rolex in the final grand prix of the WEF season. Daniel Bluman (ISR) and Ladriano Z, owned by Over the Top Stables LLC, would enter the jump-off next, but it was not to be when they had a rail at the Adequan vertical. They finished on four faults in 39.09 seconds for sixth place. With an unfortunate fall at the second to last fence in the jump-off, Laura Kraut (USA) and St. Bride’s Farm’s Confu were eliminated and finished the class in eighth place. Next in was Rodrigo Lambre (BRA) riding Mario Onate’s Velini. With a rail down over the Rolex oxer, they would land on four faults in 40.15 seconds for seventh place. 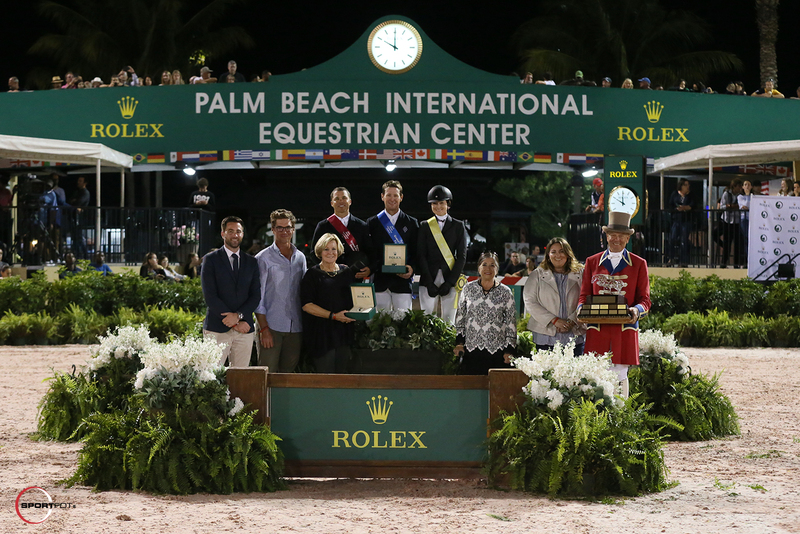 It all came down to the final rider in the ring to see who would receive the Rolex time-piece and top honors for the WEF circuit. With three wins in this final grand prix over the 12-year history of the class before Saturday night, Ward was certainly stiff competition. 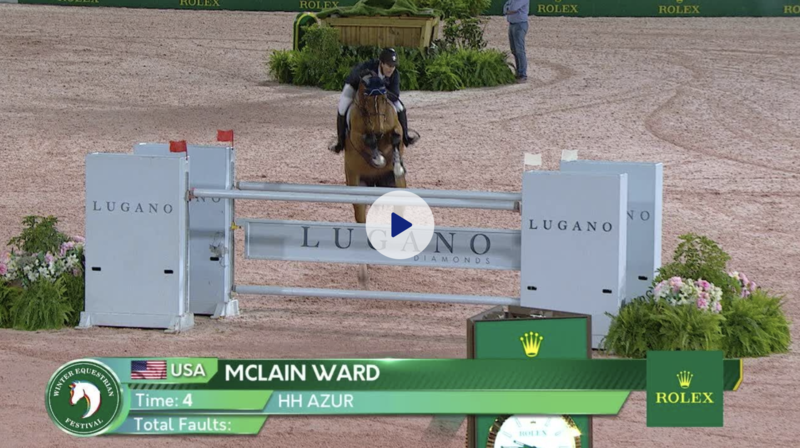 Tapping into HH Azur’s massive stride and incredible talent, Ward galloped around and made short work of the jump-off. After adding a stride in the final rollback, Ward pushed to the final Rolex oxer. They sped through the timers in 37.42 seconds to take the win over Farrington by four-tenths of a second. Click here to watch their winning ride! It was a great return to the top for the HH Azur, who is owned by Double H Farm, François Mathy, and Ward. A slight injury kept her from competing at the FEI World Equestrian Games™ Tryon 2018 and since then, Ward and his team have worked to return her to her winning ways. “I’m really excited for Azur and all of her owners,” said Ward of the 13-year-old Belgian Sport Horse mare by Thunder van de Zuuthoeve x Sir Lui. “It’s been a long road back since she was injured last summer. Obviously, she’s one of the best horses in the world, and her not being fit and healthy for the WEG was a huge disappointment to everybody involved with her. It’s a real testament to Tim Ober, our vet; Mikey Boylan and Lee McKeever and his team, who really brought this mare back to top sport. Mark Bellissimo, CEO of Equestrian Sport Productions, thanked the athletes for the in-credible sport that took place and noted the steady growth seen over the last 11 years of the Winter Equestrian Festival. “It was probably the biggest crowd that we’ve ever had here,” he said. “It was a great show that these three athletes here – a new generation in Lucy and two of the most gifted athletes in the sport – gave, to go out there and compete at this level is just absolutely fantastic. 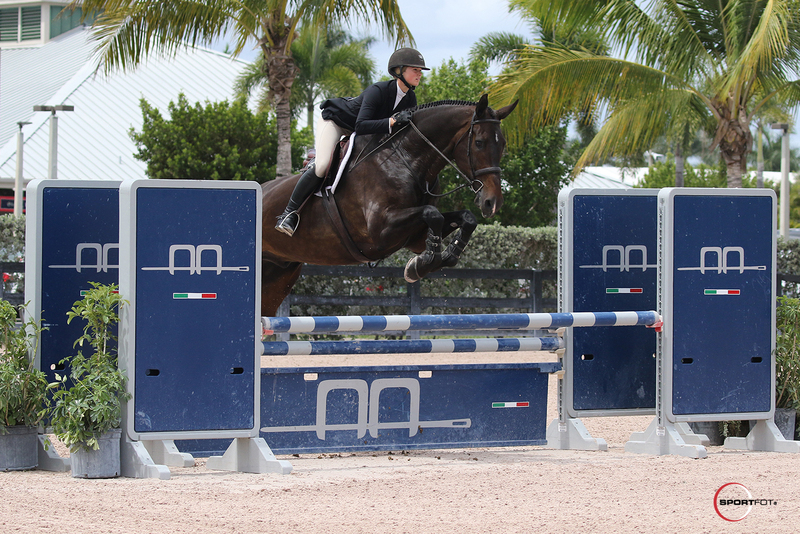 In the final days of the 2019 Winter Equestrian Festival (WEF), Sophia Mitchell and Madison Mitchell added their names to the list of champions for the Alessandro Albanese Equitation 15-17 division. The Week 12 class saw 49 horse-and-rider combinations and therefore was held in a California split format which allowed for two champions and two reserve champions. Sophia Mitchell piloted Lily Walton’s 11-year-old Oldenburg gelding (Contendo I x Anytime), Callahan, to an impressive total of 30 points to receive the title of section A champion. Sophia and Callahan are a new pair that has only come together in this 2019 winter circuit but have clearly found their rhythm as the highest-scoring combination in the division. “He’s really been an incredible first equitation horse, and I couldn’t imagine learning to do the equitation on anyone else,” Sophia said. She stated that while she has many things to continue working on, she feels her attention to detail during training is what paid off for her this final weekend. Madison Mitchell, a working student for Don Stewart, picked up the section B champion title with Damon, an 11-year-old Dutch Warmblood gelding (Massimo x Dubertha) owned by Cleopatra Georgiades. She also credits her success in the saddle to the many no-stirrup lessons held at Stewart’s farm. The reserve champion for section A went to Ellie Ferrigno and the HBC Sport Horses’ seven-year-old Oldenburg gelding (Chacco Blue x Grandewka), Chambertino. Miles Holman and Caroline McLeese’s 14-year-old Holsteiner gelding Caprisio (Cassini II x Elfe I) earned the section B reserve champion. The final day of WEF will be Sunday, March 31, and will feature the $50,000 Puissance America Grand Prix CSI 2* as well as the $50,000 CaptiveOne Advisors 1.50m National Grand Prix.